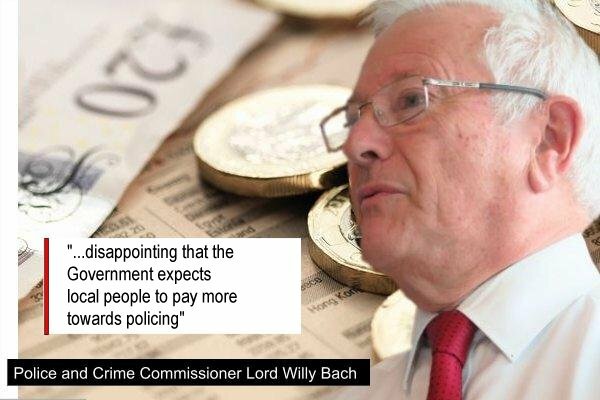 Lord Willy Bach, Leicestershire’s Police and Crime Commissioner (PCC), will present his budget plans to the Police and Crime Panel next week, which include an additional 107 local police officers. Of these 107 extra officers, it is expected that 80 will be recruited in the 2019-20 financial year, with the remaining 27 coming on board in 2020-21. Willy Bach said he was delighted to see such a significant growth in local officers, something he has consistently pledged to deliver. However, he added that it was disappointing that this needed to be funded by a 12% increase in the amount local people pay towards policing boosted by a further £5.1M from reserves over the next four years. In December 2018 the Government made it clear that it expected Police and Crime Commissioners to increase the amount of council tax paid towards policing by £24 for a Band D household in 2019-20. A survey, carried out by the PCC, found that over 70% of respondents were willing to pay the increased amount. Thanking the public for its support, Willy Bach said he was determined to see additional funding from this increase invested in the things that matter most to local people. There were 1,101 responses to the survey. Of these, 1,077 responses were from council taxpayers across the area and 72% of those were in favour of an increase of up to £2.00 per month (£24.00 for the year) for a Band D household. “People want to see more police in communities and this budget will enable us to recruit 107 extra officers,” he said. “I’m delighted that we are at last in a position to see real growth in officer numbers, but I should be clear that this is only happening due to an increase in the police portion of the council tax and a hefty chunk from our Reserves. “It is hugely disappointing that the Government expects local people to pay more towards policing but if I am to increase officer numbers I have no option but to raise the police precept. “Local people are now paying the price for years of austerity, but PCCs have been left with no alternative. Even this will not solve all the financial challenges. Of every additional £24 raised, £14 will be used to pay for rising costs and overheads, leaving just £10 to invest in new resources. To protect our plans in the future I have agreed to use money from our reserves over the next four years. The Commissioner will present his budget plans for scrutiny to the Police and Crime Panel on 1 February alongside his proposals for the policing precept, which will be put forward for the Panel’s approval. He will explain that he intends to set the budget for policing Leicestershire in 2019/2020 at £187.1M, an increase of £10.88M (6.2%) over the previous year. Of this £114.6M will come from the Government and £72.5M from the local policing precept.